We were looking for Caister Catholic church out on the Ormesby Road, and I didn't know what to expect. As it turned out, St Ignatius would be a fairly run of the mill 1960s structure, like a school hall; but before we reached it, I saw this beautiful red brick building just off of the road. "There it is!" I yelled, as we passed the entrance to a large graveyard. Not to be phased, Chris swung the wheel and we squeezed through the gap in the wall without so much as a squeal of brakes from the cars that had been following close behind. 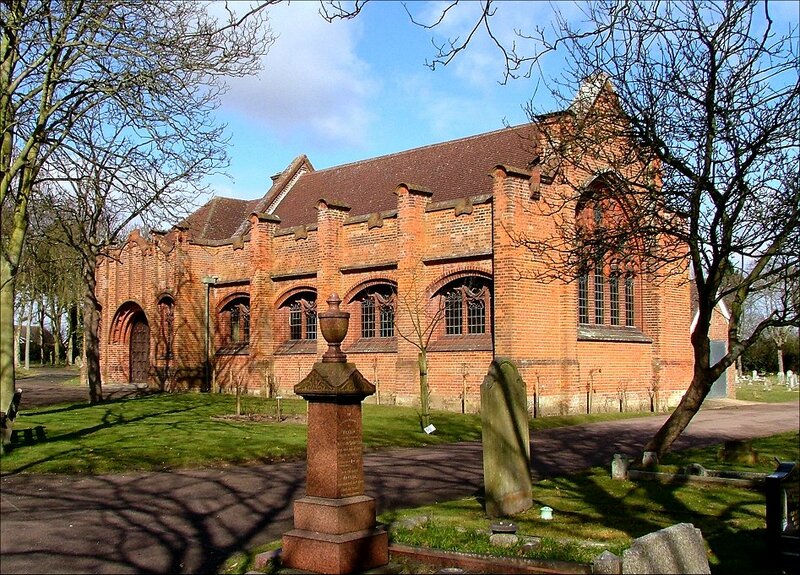 This turned out to be the new cemetery, and the red brick building is the cemetery chapel. And what a delight it is! A huge Perpendicular east window, almost flamboyante, and massive castellated buttressing along the sides. Between them, low windows are deeply recessed with terracotta sills, and the narthex area at the west end has a large porch on the south side in the Tudor-bethan style. The roofs have deep-pitched municipal gravitas. Asked to guess, which I wasn't, but I did anyway, I would have said 1920s, mostly because it reminds me of Ipswich central library. In fact, it turns out that is as early as 1904, and the work of JW Cockrill, the Yarmouth Borough architect. 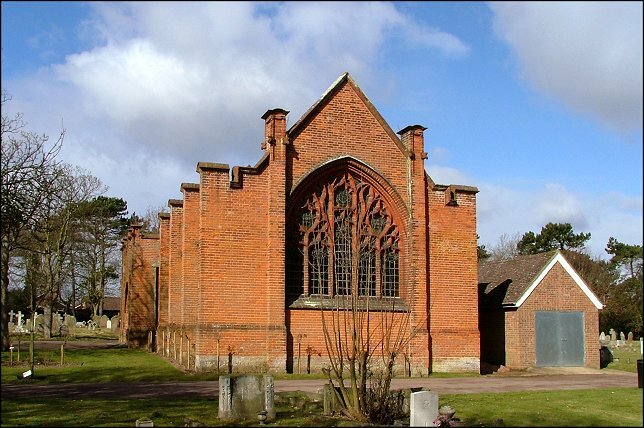 Poor Pevsner, who despaired of ever finding anything nice to say about Caister, came upon it and almost burst with enthusiasm, describing the tracery as Arts and Crafts inspired. And he's right; here we have a little prototype for something that might appear on a grander scale in Betjeman's Metroland a quarter of a century later, Gothic becoming modernist as the bricks start to shake off their form and find their function. Worth seeing.